This humble year of our Lord called 2008 is set to explode in the mind of this camera-politico-junky dream. Forces are in motion and old battle scores are set to be replayed on the global stage. We in the pro-amature photo industry news business take these things very seriously – more intently and at a higher adrenalin level than any fool CNN political commentator War junky journalist on the Net today. The Photo Marketing Association held it’s yearly show, and among camera announcments from Canon, Nikon, Sigma, Pentax and others, Sony is set to transform the digital camera market. The stakes are higher than those wars overseas and every online junky comes out of the digital net to blast competitor companies and raise their favorite brand to Buddha like reverence with the crafty spirit of a Sun Tzu trained assassin. For those in the know, the competition between digital single lense reflex (DSLR) camera manufacturers is nothing less than a precision guerrilla war on the global chess board. In any competition there are those on the top and there are underdogs. The Goliath of the camera industry is Canon. Dominant in the pro sports market their lenses and bodies penetrate the consiousness of anyone who has seen a main stream camera in the past 20 years. Canon was really the first camera maker to develop its own imaging sensors and use full frame (35mm film sized) sensors. Their pro cameras are always at the top of the performance charts and have dominantly defined the direction of digital camera technology since Kodak dropped the ball in developing DSLR technology. Canon is the Golaith to knock off, and Nikon started the real assault late in 2007 with the release of the D3, a full frame high ISO DSLR beast which is creating a movement of dollars back to the Nikon brand. Aside from Nikon, the small companies like Pentax, Olympus, and the now defunct Konica-Minolta released cool technologies like in camera images stabilization, anti-dust, and Live View innovations, which were either capatilized upon, improved, or ignored by Canikon. Unlike War, the photography battles occur at prearranged places, generally the yearly PMA and biannual Photokina. This year they’re both going down and the bloody push for market share is fierce. The stage is set to explode because one last vestiage of the samurai inspired Nihon-Camera tradition has begun to growl and show its silver back. The general camera geek consumer has been waiting for a hammer to drop… that full frame DSLRs would be produced is such numbers that they would actually become affordable and Canon would be knocked on its head – and this is one large step closer to reality. Sony is more or less leap-frogging over Olympus and Pentax, which Minolta was incapatble of doing. 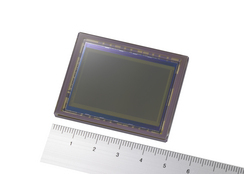 With in-house sensor manufacturing abilities and global marketing reach, Sony has the power to do what Nikon has had trouble with – entering a head-to-head Ram style war for the high resolution Pro-oriented DSLR market. The combination of Minolta camera technology, Zeiss lenses and a 24.81 megapixel CMOS imaging sensor is the camera industry equivalent of a country aquiring full-blown nuclear capabilities with ICBM cluster delivery systems overnight. No matter your moral affiliations it means something, and the world will never seem the same again. Of course, we’re dealing with cameras here, not atomic demons, but the analogy will stick for now. The hammer is coming children…and it’s set to slam against the ground with the full force of an 800 lbs Japanese Gorilla behind it – and all the camera junkies are laying money down on Sony in announcing their Alpha 9/A900 full frame DSLR at Photokina in September 2008.